Need a rental car? Give us a call to discuss the options, depending on where you are staying you might not need one. There are two ways of arriving in Victoria from Seattle. You can either drive to Vancouver BC and take a ferry to Vancouver Island or you can drive to Anacortes WA and take a ferry to Vancouver Island from there. The trip to from Seattle to Vancouver takes about 3 hours. The Vancouver-Victoria trip includes a ferry ride of 1 hour and 45 minutes and a 25 minute drive into Victoria from the Swarts Bay Ferry terminal. The trip from Seattle WA to Anacortes WA takes about 1 and a half hours. The ferry ride to Sidney BC on Vancouver Island then takes approxmately 2 hours. Be aware that there are only 2 ferry departures per day for this ferry. For more information on travelling from Seattle to Victoria Via the Anacortes ferry route you can visit the Wasington State Ferries web site for more information on the Anacortes Washington to Sidney British Columbia Ferry service. Equally distanced between Seattle to the south and Vancouver, B.C. to the north (approximately 85 miles from each), Anacortes rests on the waters of the Pacific Ocean on beautiful Fidalgo Island. Merge right onto Peterson Rd. Once you reach Anacortes merge right onto Commercial Avenue to reach the central business district. Take a left at 12th St and follow signs to the ferry terminal. Once you have left the Anacortes Ferry on Vancouver Island, follow the signs to Hwy 17 and Victoria. When you reach the intersection with Hwy 17, turn left and follow it until you reach Victoria BC. Travel on I-5 North to the Canadian border. Once in Canada, after going through the Douglas Border crossing, I-5 becomes Highway 99 which travels north into Vancouver. Take Highway 99 North till you reach Highway 10. Go West on Hwy 10 to Hwy 17. Travel Southwest on Hwy 17 till you reach the Tsawwassen ferry terminal. You will need to board a BC Ferries ship to travel the 1 hour and 45 minutes trip across to Vancouver Island. You can check the schedule of these ferry sailings by clicking this link. Once you have left the BC Ferry on Vancouver Island you will be travelling South into Victoria on Hwy 17 from Sidney BC. Continue on this Hwy until you reach Victoria. While in Vancouver travel South on Oak Street till it intersects with Highway 99. Take Highway 99 South to Highway 17. Travel Southwest on Highway 17 to the Tsawwassen ferry terminal. The total estimated driving time: about 40 minutes depending on traffic conditions. Directions from Vancouver International Airport: Look for traffic signs leaving the airport terminal and follow the signs to Highway 99 South. Take Highway 99 South to Highway 17. Travel Southwest on Highway 17 to the Tsawwassen ferry terminal. The total estimated driving time: about 25 minutes depending on traffic conditions. As the weather conditions for Sothern Vancouver Island and the Vancouver mainland are mild and temperate, be prepared for heavy rain and wind in winter to cause poor driving conditions. In a very rare case will there possibly be snow, though it does not snow every winter. Use of seatbelts in BC by drivers and passengers is mandatory. Use of headlights during daylight on all vehicles is highly recommended. The maximum speed limit on Highway 99 is 80 km per hour with many slower areas along the way. 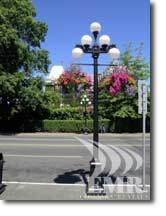 Scheduled service of motor coaches from the Vancouver International Airport and Vancouver Bus Depot to Victoria BC. Shuttle drops passengers directly at many stops on the way to Victoria as well as the main bus terminal in downtown Victoria. Daily scheduled Float Plane service from Vancouver, Victoria, Nanaimo, Gulf Islands, and Queen Charlotte Islands. As the largest seaplane based airline in the world, they feature scheduled flights, charter service and packaged excursions. Daily schedyuled flights from Vancouver, Seattle and many other smaller locations.